With new features like storage for up to 10 wine bottles, stemware rack and space for storing wine, other libations plus wine accessories, the updated Shaker Hill Wine Buffet is ideal for keeping spirits high in your home. The Shaker Hill Wine Buffet from Weaver Furniture Sales comes with key features wine lovers want. The Shaker Hill Wine Buffet is designed with all the top features wine lovers want in a wine server. 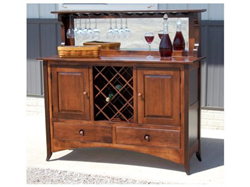 Wine aficionados looking for the perfect piece of furniture for wine storage, serving and entertainment will want to consider the Shaker Hill Wine Buffer from Weaver Furniture Sales of Shipshewana, Indiana. The Shaker Hill Wine Buffet was designed with all the top features wine lovers want in a wine server. It stores up to 10 wine bottles. Also, the cupboard space behind the raised panel doors provides lots of room for storing additional wine and spirits, as well as wine-serving accessories. Both drawers open full extension, thereby providing easy access to the back of each drawer. Wine glasses are close to hand, thanks to the convenient stemware rack in front of the bevel mirror. As an option, customers can order the wine buffet with the stemware rack and a pull-out rack behind each door down below. As its name indicates, the Shaker Hill Wine Buffet comes with all the classic Shaker accents. These include its simple profile, inset wooden hardware, a gently arched base and flared feet. Amish artisans, who are legendary for their cabinetmaking expertise, custom-build each Shaker Hill Wine Buffet. Also, these cabinetmakers use regional hardwoods like cherry, maple and oak. As a result, the wine buffet is known to be sturdy and durable. Customers can order the wine buffet as shown. Or, they can request custom features like the wood specie, many new stain colors and new hardware styles. Each personal selection results in extraordinarily unique furniture piece. Also, the Shaker Hill Wine Buffet can be ordered through the company website at http://www.WeaverFuritureSales.com. Or, shoppers are encouraged to visit Weaver’s ‘brick and mortar’ store in Shipshewana, Indiana. The large Weaver Furniture showroom is located 1/4 mile south and 1/4 mile east of the junction of State Road 5 and US 20 in Shipshewana, Indiana. Weaver Furniture Sales is open daily from 9 a.m. to 5 p.m., 9 a.m. to 4 p.m. on Saturday. The store is closed Sunday. For more information, visit Weaver Furniture Sales website. Or call 260-768-7730. Weaver Furniture Sales was established in 1989 in Shipshewana, Indiana. An Amish, family-owned furniture business, Weaver offers a full line of solid wood, Amish furniture at affordable prices. And Weavers caters to both residential and commercial customers. The company features Shaker, Mission and Traditional furniture styles. As part of their client services, Weavers provides furniture design consultation services, custom furniture options, furniture quotes, layaway options and various delivery alternatives for residences and businesses in the United States. LeRoy and Ida Weaver own and operate Weaver Furniture Sales. They began with a 1,500 square foot showroom, which has been expanded to more than 20,000 square feet. Previously, they owned and managed LeWana Dairy Farm, where they milked cows and raised corn and hay. Weaver Furniture LogoAmish Furniture logo from Weavers.